Why is there such a stigma of having cockroaches in one’s home? Cockroaches earn their stigma because of their association with unsanitary conditions – crumbs or open food in kitchens and pantry, open pet food, leaky faucets, unsealed areas around pluming pipes, for example. Cockroaches damage property and contaminate the food they touch and spread diseases including viruses, bacteria, fungi and protozoans. In fact, they are the number one cause of childhood asthma in the U.S. In large numbers they have a distinctive odor from their feces and oral secretions. In large numbers then can even feed on people. Enviroguard's pest management professionals use roach baits strategically where cockroaches crawl to eliminate colonies. Sanitation too is a component in further roach control and elimination. Cockroaches have a sentry system that detects low frequency wind different from normal air movements. Enviroguard's pest management professionals use a vacuum cleaner outsmart a cockroach’s sentry system by aiming a nozzle at it. Cockroaches have tiny hairs on their cerci or jointed tail prongs that sense changes in the air. When the insect detects suspicious wind, like a shoe about to step on it, it quickly takes off. The roach perceives the suction as wind coming form the opposite direction, and will flee into the nozzle. I have a very clean home. Why do I have cockroaches? Cockroaches are not always a sign of a dirty home. These pests can enter your home on a number of items. First, check for any books or stacks of papers you may be storing. Have you recently bought books or papers from a garage or estate sale? Books and papers are popular hiding places for roaches. Paper bags and cardboard containers brought in from the grocery store can harbor cockroaches as well as silverfish, spiders and occasionally, even mice and rats. Old carpet and rugs and even your small stack of inside firewood may harbor roaches. Store your cleaned linens and woolens in plastic bags. Remove flours, grains, and cereals from their original cardboard or paper packaging and store them in air-tight plastic containers with a tight-fitting lid. Do the same for other dried foods and sugary foods. Seal all food in pest-proof containers or place in the refrigerator or freezer. Be sure your use plastic trash bags in all inside garbage cans and remove your trash daily to sealed outdoor containers away from your home. Check too for any spoiled fruits and vegetables. Ensure that no vines or shrubbery touch your home. Check and caulk all holes or spaces around doors and windows. Install a metal threshold on the bottom of all exterior doors to close any gaps. To seal with the bottom of the door as these are popular entry passageways for cockroaches. Finally remember to dispose of vacuum cleaner bags. I recommend changing your bag at the end of each cleaning session. If your vacuum does not have a disposable bag, remember to clean the debris container after each use, preferably with soap and hot water if your manufacturer allows. Do not store a vacuum that contains dust and debris because the soiled bag may contain insect eggs and the decaying organic matter in the vacuum bag will provide both shelter and a food source for these pests. Can cockroaches actually survive radiation? This is a commonly asked question because it is often extremely challenging to eliminate cockroaches. Research has shown the main reason for their survival is because they are a primitive species. Cockroaches are less complex and thus have less DNA for ionizing radiation damage and their cells are not as likely to be killed by a large radiation exposure. With fewer dividing cells, adult roaches are indeed less unalterable to radiation than humans. When I returned from a trip, my house had an extreme problem with cockroaches. Your technician mentioned I needed a “clean-out.” What is this? The term clean-out describes the pest control strategies employed to eliminate an out-of-control pest population in a given situation. This means pests have increased beyond acceptable or threshold levels. While it is virtually impossible to eliminate all pests from your living environment, more than a few pests, and especially visible ones, are cause for alarm. In an attempt to bring the population under control, the clean-out is an aggressive initial strategy. Causes for needing a clean-out are many, but the most common are: no prior pest control company or methods employed, too much time has elapsed since past treatment, proliferation of pest population due to poor sanitation, weather, and owner apathy. In your case, too much time may have elapsed since your prior treatment and your absence gave pests free run of your home. Small bits of food hidden in cracks and crevices or behind appliances may have sustained and increased the cockroach population. 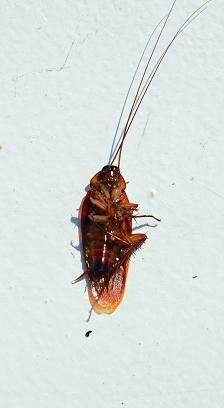 In fact, cockroaches are often the first pest that comes to mind in a “clean out”. However, other pests can include stored product pests, ants, fleas, bedbugs, rats and mice. Key residential clean-out locations are always the kitchen, bathroom pantry, bedroom laundry room, and around appliances. On the exterior of your property, the garage, landscaping and mulch, decks, outbuildings, stacks of firewood, and around heating or cooling units must be inspected. In commercial locations prime clean-out locations are offices, shared kitchens, break rooms, restrooms, and storage closets. Outside offices and other businesses, landscaping and mulch will often harbor growing pest populations as will heating and cooling locations, and warehouse space. Open dock doors are another key entry point. In commercial kitchens, pest control technicians will focus on food preparation areas, dishwashing stations, pot and pan storage areas, mop rooms, ceiling posts and vents, floor drains, and doorways. Even cracked tiles, garbage disposals and free standing sinks and the backsplash area may provide the items pest need to thrive – food, water, and shelter. Enviroguard's pest management professionals will look for pests and the signs they leave behind including cast skins, carcasses, and live insects. If immature forms of the insects are found (larvae, nymphs), your technician can better know the stage of the insect's lifecycle and vary treatment and control techniques. Since most pests are nocturnal, it is important to consistently look in cracks, crevices, electronic equipment, and other harborage areas – both high and low. In a clean-out situation, pesticide applications work best when applied to cracks, crevices, and voids where pests hide. Secondary treatment locations include, but are not limited to, travel routes between pest hiding places and where they find food and water. Foraging routes are along edges and corners of walls and pipes or table legs, and other routes easy for pests to follow should be investigated. It is important for you to work with your technician and provide feedback regarding the effectiveness of the clean out methods. The technician may also recommend more frequent services to eliminate the out-of-control pest population. Your technician may want to treat your home at different times of the day and may vary their treatment of chemicals, baits, and traps. Other suggestions to eliminate your problems would be to seal all cracks and crevices, check that windows, doors, and screens fit tightly, and add weather stripping as needed. Remove debris that could be harborage. This would include leaves, tall grasses, rotting wood, wood piles, and other cellulose materials. If any aspect of the program is ignored, pests will develop rapidly. To maintain the success of the clean-out program, it is critical to continue your pest control service at least on a quarterly basis. I rent an office for my professional business practice. The location is in a strip shopping center between two restaurants. I've recently moved to this site and my office staff and clients have noticed cockroaches on the floor and walls. Pest control is the responsibility of each tenant and is not provided by the building owner. What can I do to control these cockroaches? Controlling cockroaches in restaurants is indeed challenging. If your restaurant neighbors have pest control service, the obvious problems with their service should be communicated. They may want to inquire how the pest control technician is working to control the problem. Also, are the restaurants doing everything they can to eliminate food waste, improve sanitation, and reduce the number of potential harborage sites for cockroaches? The challenge in your case is to prevent cockroach entry. Enviroguard Pest Solutions uses specific, targeted bait placement where roaches congregate or travel. In connected buildings like your office in the strip mall and as in apartments, control is more difficult due to shared walls, floors, common utilities, and ceilings. If you have open ceilings between the establishments and only have suspended ceiling tiles in place, these are attractive hiding places and travel corridors for roaches to move from one office space to another. The first step is always sanitation. Try to work with the other tenants to improve the hygiene of the outside and inside areas as well as secure trash. Next seal all cracks in your office, particularly around plumbing access, pipes and electrical conduit. Use a good quality latex caulk or expansion foam for this purpose. Good door sweeps and closure is also recommended. If your fellow tenants could agree, a shared pest control service is recommended so each office and restaurant can be treated simultaneously using the same treatment protocols. If not, your pest management professional must work diligently and often, placing baits in cracks and crevices and use products that form barriers around your walls and ceilings. Monthly service is recommended in this situation. Call 706-965-9078 and we will dispatch a technician.